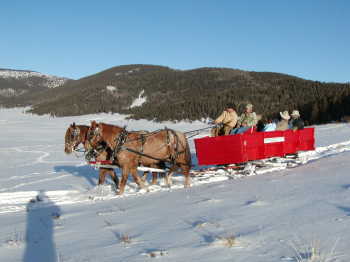 Bear Creek Adventures, LC, has horse drawn carriages, wagons and sleighs. This coach is an exact replica of an 1880`s Concorde Coach that was used extensively in the west. It is a fun and handsome vehicle for almost any occasion from weddings to parties or parades. Comfortable interior seating allows for up to 9 adults. 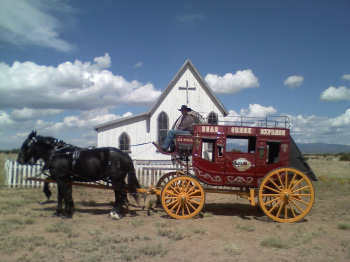 For an additional fee, the lettering on the sides of the coach can be changed to fit your specific request and a four-up of handsome draft horses are available to pull it. This coach is equipped with lights for events after dark. 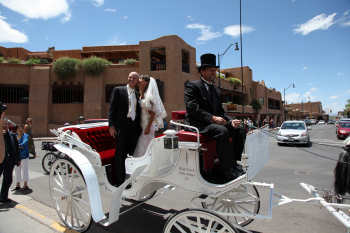 Known to some as a "Cinderella Carriage" this vehicle is ideal for formal events such as weddings. 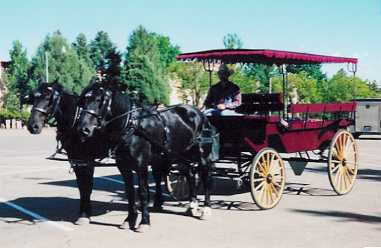 The exterior of the carriage is white with burgundy pin striping. The interior is burgundy cloth. This carriage has a convertible top and lights for events after dark. Seats 4-5 passengers. 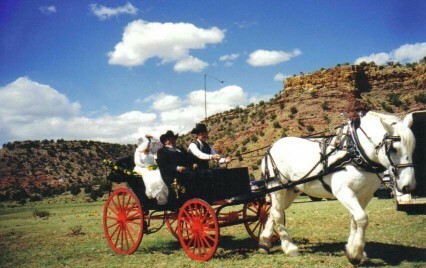 This carriage is ideal for "old timey" events such as western weddings, or re-enactments. It is black with red wheels and a black interior. This carriage also has a convertible top and lights for events after dark. Seats 3 passengers. This wagon is great for transporting people. The wagon is red with white rims and running gear. The red interior sports padded seats, and some storage space as well as lights for events after dark. This wagon is wheel chair accessible. Seats 15 adults. These wagons are perfect for transporting large numbers of people. They are built on a heavy duty running gear with rubber tires and springs to make for a very comfortable ride. They are equipped with comfortable wooden seats. One wagon is red with white rims and details, the other is tan with white rims. Both wagons have lights for events after dark. 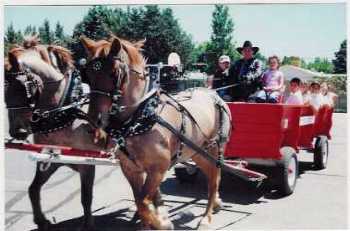 Each wagon seats 20-25 adults. 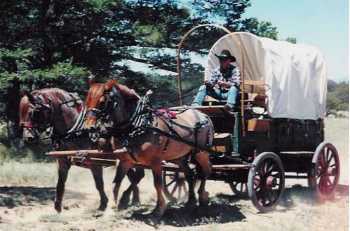 This is authentic wood/iron wheeled, covered wagon believed to have been built around 1880. 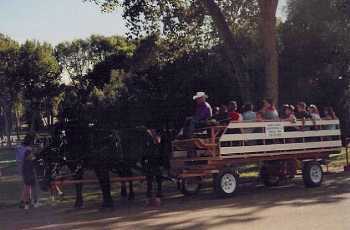 This wagon is excellent for parades, as a back drop for photos or as a chuck wagon. 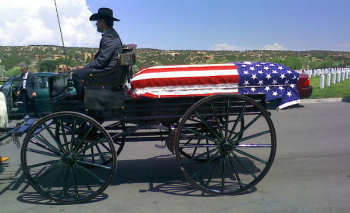 We do not use this wagon for transporting people. This wagon is excellent for moving people and also for special, more formal occasions. This vehicle is equipped with springs and burgundy cloth padded seats for a very comfortable ride. This vehicle is also equipped with lights for events after dark and can carry 12 adults comfortably. This sled is great for transporting people. The sled is red with a white running gear. The red interior sports padded seats, and some storage space as well as lights for events after dark. This sled is wheel chair accessible. Seats 15 adults.